· A great way to improve your lighting for product and portrait photography. · Extend the bar and adjust the angle using the butterfly knob and you will have a stand with a two section boom ready to use. · The arm bar can be extended to the length of 75inch/190cm.Sets up easily in a matter of seconds.3 legs stages at the bottom to have solid stability. · The boom allows you to place a light directly over your subject matter for great separation and light control.It can also be rotated to 180 degree,so you can shoot the subject under different angle, and then you will capture various beauties of it. · An included sandbag gives a perfect counterbalance for safety and smooth movement.Note:The softbox is not included.Do NOT take out the boom arm to use it as light stand. 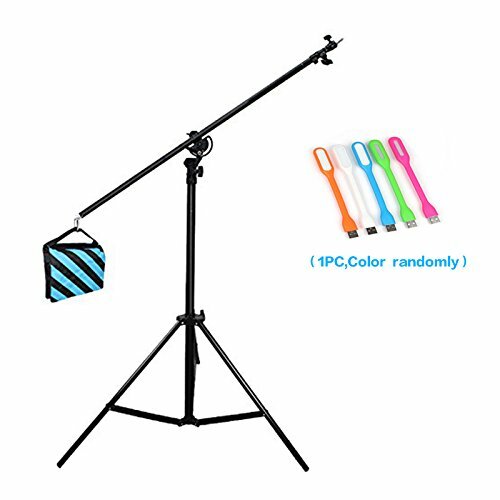 2 Way Rotatable Photo Studio Boom Stand Extend the arm bar and adjust the angle using the butterfly knob and you have a stand with a two section boom ready to use. There is no need to purchase an extra arm bar or the clamp because this boom stand has it all. If you have any questions about this product by CONXTRUE, contact us by completing and submitting the form below. If you are looking for a specif part number, please include it with your message.